Introduction: Mechanical instrumentation and chemical irrigation alone is not considered enough to eliminate microorganisms in the deeper layer of root canal system. Therefore, antibacterial medicaments are required for complete disinfection of root canal dentin. Case Presentation: Triple antibiotic paste application (metronidazole, ciprofloxacin and minocycline) have demonstrated good clinical and radiographical results for treatment of presented traumatized teeth with periapical lesion. Conclusion: It confirms that conservative treatment should be first option for treatment of periapical lesion. Triple antibiotic paste has benefical effects for traumatized teeth with periapical lesion. In this article, the treatment of a case with periapical lesion due to trauma in the upper incisors by TAP and 18 months clinical and radiographic follow-up have been presented. A 16-year-old systemically healthy male patient applied to our clinic with a complaint of toothache after falling. In the anamnesis taken from the case, it was learned that the patient broke his right and left upper central teeth about 1 year ago after the fall but did not apply to the dentist within this period. 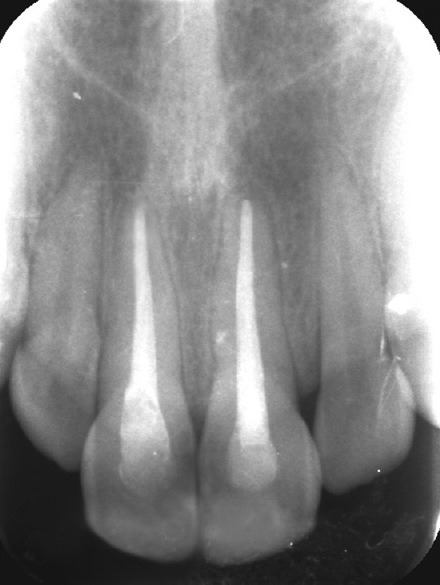 Complicated crown fracture and large periapical lesion were determined in teeth 11 and 21 in clinical and radiographic examination [Figure 1]. While no pathology was detected in extraoral examination, vertical percussion was found in the teeth 11 and 21 in intraoral examination, and a negative response was obtained from the teeth in the electric pulp test. According to clinical and radiographic findings, nonsurgical endodontic treatment and then restoration of teeth were planned. Treatment procedure was explained to the patient and a written consent was taken. Following the local anesthesia, the access cavity was prepared and the working length was determined by first entering the root canal with ten K-files. After extirpation and intracanal drainage, the instrumentation was performed using a step-back technique with 15–40 file under plenty of sterile saline and sodium hypochlorite irrigation. Root canals were dried by sterile paper points, and calcium hydroxide paste (Ca[OH]2) was applied to the root canal to provide antibacterial activity. The access cavity was temporarily closed with glass ionomer cement (Fuji IX GP, GC Europe NV, Leuven, Belgium). Two days later, the patient came to the clinic with the complaint of increased pain and the sign of tenderness to palpation. Calcium hydroxide paste in the canal and intracanal infection were washed by saline solution and it was decided to administer TAP. As previously standardized in the literature, TAP (metronidazole, ciprofloxacin, and minocycline) was prepared by mixing carrier propylene glycol with antibiotics that each of them contain 100 mg and was sent into the canal with the help of lentulo. The access cavity was temporarily closed with glass ionomer cement as before. In the control session, 2 weeks after the application of TAP, it was seen that the symptom of the patient was disappeared. TAP was renewed once a month and left in root canal for 3 months. In the examination performed at the end of the 3rd month, since the patient is asymptomatic and pathological symptoms are lost, root canal treatment was completed with gutta-percha (SPI Dental Mfg, Inc, Korea) and canal paste (AH-plus, Dentsply, Weybridge, UK), and teeth were restored with composite resin (Single Bond Universal/Filtek Supreme-3M ESPE, USA) [Figure 2]. After 6 and 18 months, the affected teeth were assessed clinically and radiographically. While the teeth were asymptomatic on clinical examination, the radiographic examination revealed an increase in bone density and healing in periapical lesion [Figure 3] and [Figure 4]. The aim of conservative endodontic treatment is to minimize the surgical intervention and maintain health and function of infected teeth. Therefore, all inflammatory periapical lesions should first be treated with conservative procedures. Bacterial flora has a complex structure in endodontic infections, and the number of bacteria is usually between 102 and 108 colony-forming unit (CFU) in infected canals. Furthermore, the symbiotic relationship established between bacteria increases the virulence of the existing organisms in the ecosystem. Hence, the endodontic treatment that will be applied should be to remove the entire population of bacteria in the root canal. In recent years, the Cariology Research Department of University of Niigata has developed the concept of “lesion sterilization and tissue repair,” which involves the use of a combination of antibacterial drugs for the disinfection of infectious lesions, including dentin, pulp, and periradicular lesions too. According to this concept, it is thought that the repair of damaged tooth tissues will take place after the sterile environment has been provided and stated that repair of damaged tissues will occur after disinfection of the lesion. Vitro studies related to topical antibiotics have shown that metronidazole, ciprofloxacin, and minocycline are effective against endodontic pathogens in necrotic/infected root canals.,, Metronidazole was the first choice among antibacterial drugs because the majority of the bacteria in the deep layers of infected dentin in the root canal wall consist of obligate anaerobes. However, metronidazole is insufficient to kill all pathogenic bacteria even at high concentrations. Therefore, it was combined with ciprofloxacin and minocycline to sterilize infected root dentin. In the study conducted by Windley et al. in which the efficiency of TAP for disinfection of apical periodontitis dog teeth was evaluated, three samples were taken from root canals, before irrigation (S1), after 1.25% sodium hypochlorite irrigation (S2) and after application of TAP. While the bacteria culture produced 100% positive result in the sample S1 (1.7 × 108 CFU), 10% of the samples cultured in S2 (1.4 × 104 CFU) and 70% of the cultured samples in S3 (26 CFU) were free of bacteria. These results show that TAP is effective in disinfection of apical periodontitis teeth. It has been shown that TAP is effective in regenerative endodontic treatments and in the treatment of large periradicular lesions, as an in vivo intracanal disinfectant., Iwaya et al. 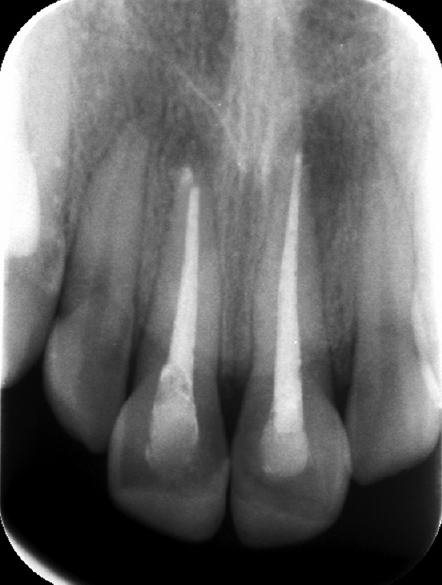 used the combination of irrigation solution and TAP in decontamination of immature teeth with pulp necrosis and observed thickening of dentin wall and healing in apical opening and periapical lesion. 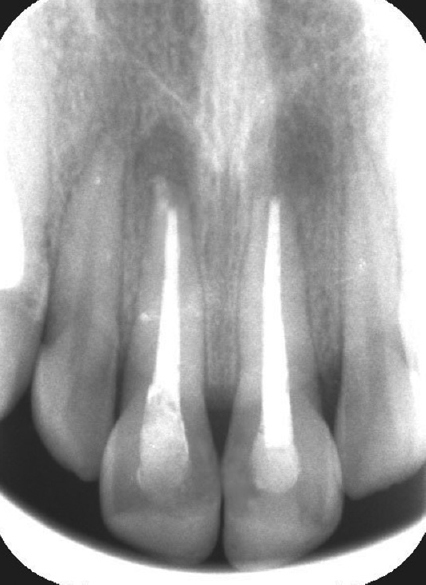 In addition, TAP was used by various researchers in the treatment of large periapical lesions in the literature, and apical lesions were treated conservatively without the need for surgical methods.,,, Similarly, a calcium hydroxide paste was first used to cure the periapical lesion; however, the treatment protocol was changed and a TAP was applied because the symptoms did not decrease in the case presented in this article. After the application, the symptoms have fallen. In the application of TAP, which is a successful method in intracanal sterilization and revascularization, although the doses of the drugs given are small, a delicate procedure should be followed as in all systemic or local drug applications. Especially, individuals who are sensitive to chemicals or antibiotics in medicines should be identified with anamnesis before the treatment. In the meantime, bacterial resistance to antibiotics and tooth discoloration caused by minocycline in the TAP are the disadvantages of this technique. Cefaclor and fosfomycin are suggested as possible alternatives for minocycline in terms of antibacterial efficacy, but the effectiveness of these two antibiotics in root canal should be revealed by further clinical trials. In the study, decline in symptoms and decrease in lesion size have been obtained with the application of intrachannel drainage and TAP to the large periapical lesion caused by trauma. The success of 18 months of clinical and radiographic follow-up confirms the information that periapical inflammatory lesions should be treated first by conservative means and application of TAP is an effective treatment method for periapical lesions. Kakehashi S, Stanley HR, Fitzgerald RJ. The effects of surgical exposures of dental pulps in germ-free and conventional laboratory rats. Oral Surg Oral Med Oral Pathol 1965;20:340-9. Byström A, Sundqvist G. Bacteriologic evaluation of the efficacy of mechanical root canal instrumentation in endodontic therapy. Scand J Dent Res 1981;89:321-8. Orstavik D, Kerekes K, Molven O. Effects of extensive apical reaming and calcium hydroxide dressing on bacterial infection during treatment of apical periodontitis: A pilot study. Int Endod J 1991;24:1-7. 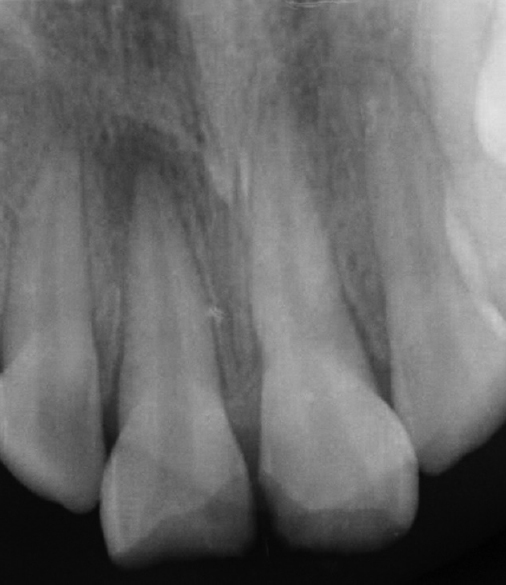 Windley W 3rd, Teixeira F, Levin L, Sigurdsson A, Trope M. Disinfection of immature teeth with a triple antibiotic paste. J Endod 2005;31:439-43. Chong BS, Pitt Ford TR. The role of intracanal medication in root canal treatment. Int Endod J 1992;25:97-106. Hoshino E, Kurihara-Ando N, Sato I, Uematsu H, Sato M, Kota K, et al. In-vitro antibacterial susceptibility of bacteria taken from infected root dentine to a mixture of ciprofloxacin, metronidazole and minocycline. Int Endod J 1996;29:125-30. Sato I, Ando-Kurihara N, Kota K, Iwaku M, Hoshino E. Sterilization of infected root-canal dentine by topical application of a mixture of ciprofloxacin, metronidazole and minocycline in situ. Int Endod J 1996;29:118-24. Reynolds K, Johnson JD, Cohenca N. Pulp revascularization of necrotic bilateral bicuspids using a modified novel technique to eliminate potential coronal discolouration: A case report. Int Endod J 2009;42:84-92. Mohammadi Z, Abbott PV. On the local applications of antibiotics and antibiotic-based agents in endodontics and dental traumatology. Int Endod J 2009;42:555-67. Taneja S, Kumari M, Parkash H. Nonsurgical healing of large periradicular lesions using a triple antibiotic paste: A case series. Contemp Clin Dent 2010;1:31-5. Salamat K, Rezai RF. Nonsurgical treatment of extraoral lesions caused by necrotic nonvital tooth. Oral Surg Oral Med Oral Pathol 1986;61:618-23. Lin LM, Huang GT, Rosenberg PA. Proliferation of epithelial cell rests, formation of apical cysts, and regression of apical cysts after periapical wound healing. J Endod 2007;33:908-16. Baumgartner JC, Siqueira JF, Sedgley CM, Kishen A. Microbiology of endodontic disease. In: Ingle JI, editor. Ingle's Endodontics. 6th ed. Hamilton, Ontario: B.C. Decker Inc.; 2008. p. 221-308. Parasuraman V, Muljibhai B. 3Mix-MP in endodontics – An overview. J Dent Med Sci 2012;3:36-45. Hoshino E, Takushige T. LSTR 3Mix-MP method-better and efficient clinical procedures of lesion sterilization and tissue repair (LSTR) therapy. Dent Rev 1998;666:57-106. Portenier I, Haapasalo H, Rye A, Waltimo T, Ørstavik D, Haapasalo M, et al. Inactivation of root canal medicaments by dentine, hydroxylapatite and bovine serum albumin. Int Endod J 2001;34:184-8. Haapasalo HK, Sirén EK, Waltimo TM, Ørstavik D, Haapasalo MP. Inactivation of local root canal medicaments by dentine: An in vitro study. Int Endod J 2000;33:126-31. Taneja S, Kumari M. Use of triple antibiotic paste in the treatment of large periradicular lesions. J Investig Clin Dent 2012;3:72-6. Dhillon JS, Amita, Saini SK, Bedi HS, Ratol SS, Gill B, et al. Healing of a large periapical lesion using triple antibiotic paste and intracanal aspiration in nonsurgical endodontic retreatment. Indian J Dent 2014;5:161-5. Jung IY, Lee SJ, Hargreaves KM. Biologically based treatment of immature permanent teeth with pulpal necrosis: A case series. J Endod 2008;34:876-87. Kusgoz A, Yildirim T, Er K, Arslan I. Retreatment of a resected tooth associated with a large periradicular lesion by using a triple antibiotic paste and mineral trioxide aggregate: A case report with a thirty-month follow-up. J Endod 2009;35:1603-6. Ozan U, Er K. Endodontic treatment of a large cyst-like periradicular lesion using a combination of antibiotic drugs: A case report. J Endod 2005;31:898-900. Er K, Kuştarci A, Ozan U, Taşdemir T. Nonsurgical endodontic treatment of dens invaginatus in a mandibular premolar with large periradicular lesion: A case report. J Endod 2007;33:322-4. Sasalawad SS, Naik SN, Poornima P, Shashibhushan KK. Nonsurgical healing of large periradicular lesions using a triple antibiotic paste. Indian J Oral Sci 2014;5:146-50. Kim JH, Kim Y, Shin SJ, Park JW, Jung IY. Tooth discoloration of immature permanent incisor associated with triple antibiotic therapy: A case report. J Endod 2010;36:1086-91.